1. Season fish fillets with salt, pepper and Worcestershire sauce. Dust fillets with flour, dip in egg wash and dredge through the breadcrumbs. 2. Toss garlic cloves with olive oil and salt. Roast garlic in a slow oven at 150C for 45 minutes. Remove skin and blend into a fine paste. 3. Mix garlic paste (at least 1 tbsp or more) with mayonnaise and chopped parsley. Heat oil and deep fry fish fillets till crispy. 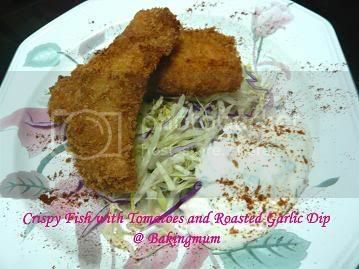 Garnish dip with tomato dices and serve with fish fillets.